Just wanted to let you know I received the pen on Friday, right in time for a local pen meetup we had in town on Saturday!!! I’ve been trying to figure out how I could express in words how amazing the pen looks and the craftsmanship that has gone into it. I eventually realized that no words I could write here would do it justice. I already had high expectations after seeing other photos of other Fantasy VPs online, but when I opened the box the pen sitting there was so many levels above what I expected. I finally had “the pen” that I’d been looking for since I got into this hobby, I never really knew what it was exactly that I was looking for, but I knew I’d found it when I opened that box!!! And writing with it!!! I LOVE the lighter weight that the FLEXIGRAN brings to the pen, it’s much more comfortable in the hand than my last VP!! Hopefully I can save up for another one of your pens someday!! I have been collecting Vanishing Points for many years and was very excited to hear about Richard’s customized pens. I was not disappointed! The fit, finish, and quality of the plastic are second to none. Richard is a true craftsman. These custom Vanishing Points are equal in quality to those that come from the factory and the colors are fantastic. I look forward to using mine for years to come. Hi Richard, I don’t have the words to describe how beautiful my VP is or the wonderful craftsmanship you have achieved. Now I need another one 😁…. I saw your sale post and checked out your web site. I’m afraid I don’t have the talent to use your supplies yet. But I did want to make a comment. Sir, you are a true artisan. What you’re doing is too impressive for me to put into words. I’m also a little jealous of your skill and ingenuity. I didn’t want anything except to say “DANG MAN, I’M IN AWE”! Just thought I’d let you know how much I enjoy my Foresta Verde Arctic pen. I have number 14/62 which has a great picture on your website. Every time I pick it up, I marvel at the craftsmanship from the handmade resin body to the unbelievable roller clip — the clip is my favorite part. I bought mine from Bert Oser at Bertram’s Ink Well a few years ago and I use the Visconti gel refill in broad turquoise — it matches the pen perfectly. Really cool. I can’t wait to see the new version!! Richard is a very creative and skilled pen maker. He has all the tools, and knows how to use them. His attention to detail, quality of materials and superior craftsmanship are the reasons the Foresta Verde pens sold so fast, and were in such demand. I am looking forward to his next creation. I purchased a pen from Richard a year ago. The best writing instrument I have used. My hair grew back, my wife became twenty years younger, and my sales grew 85%. These pens are amazing. My Autumn Bexley that just arrived by post. … The feel is wonderful. Lovely depth in the material. Very nice! it’s butter-smooth. I filled it with Noodler’s Zhivago this morning and it’s a dream to write with. The balance is great, though it’s not a pen you’d want to try to post, I think. It writes very well unposted and for long periods is quite comfortable. No skipping, good flow, and that Flexigran is just amazing. I keep finding myself just staring at it and turning the pen over and over in my hands. I was thinking of finishing off a few kits I have with some before I start trying to make customs this spring, but I’m now thinking I’ll save this for the customs after I burn through some practice acrylic first and figure out what I’m doing. Gorgeous material and a stunning pen. Couldn’t be happier! One of my very favorite ballpoint pens is Richard’s Foresta Verde. Richard discussed design ideas, plastics, and production with me and others at Pen Haven throughout the development process. He then brought in prototypes as the pen developed. Each iteration improved the look and feel of the pen. Richard’s plastics are outstanding and his workmanship is superb. However, the best part is that the pen is extremely comfortable to use and always elicits compliments from those you see it. I’m looking forward to his next pen which is currently in process. Included among my 150+ pen collection are three ballpoint pens that were custom-made by Richard Greenwald. These are among my very favorite pens from the standpoints of beauty, design and functionality. I own both an orange swirl and green swirl version of the Greenwald Model 1, torpedo-shaped ballpoint and a magnificent mink colored version of the Model 2 Foresta Verde ballpoint. In particular, the Foresta Verde always garners favorable comments and inquiries as to where it was acquired when I use it at work or in public. I am eagerly awaiting acquisition of a Model 3 Greenwald ballpoint when they become available this fall. Richard Greenwald has been crafting custom writing instruments for 14 years. He is one of those rare individuals that can use both the left and right side of his brain to not only handle the mechanics of business, but also use his inert talent to craft art pieces. As an artist myself, I have followed his work and appreciated the transformation from corporate America to artisan making beautiful pens and pencils. His wide repertoire not only appears in his ideas, but in a vast range of media. Exotic hard wood, ivory, mother-of-pearl, and a variety of precious metals sometimes using jewels to adorn his works. In addition each piece is crafted for the comfortable feel of a fine writing instrument. Greenwald’s creations have provided him with many fine pieces to add to his already extensive collection as well as add to other collectors’ inventory. He always succeeds in presenting a compelling duality of exploratory spirit and consummate artistic ability. Greenwald utilizes visual imagery from art historical movements, he creates dynamic composition incorporating the fluidity of form of Abstract Expressionism with the mystery and magic of Surrealism. His genius creates one-of-a-kind fine art pieces that exudes his usual impressionistic flair with a signature exploration of media and technique. There are several articles in the library including the best one I’ve ever read. It is “Casting Poly Resin” by Richard Greenwald and is in the 2008 year group. Also, there are other articles at http://www.penmakersguild.com in the articles section. Also, read the various threads in the “casting and stabilization” forum here on IAP. May I get on my soapbox? I really am not aiming this at any one in particular and I don’t intend to offend anyone. We have a great library here and over on the yahoo group we have a great files area. It amazes me how many of us never take the time to browse those great resources. I go there (to both of them) often and learn something new almost each time. Now I’m climbing down. Thanks. Having known Richard Greenwald for years, I find him to be a man of many passions and talents from creating to collecting. 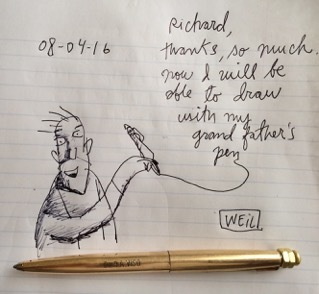 Richard has appreciated and collected fine art, hand-crafted cue sticks and pens. He is known for having one of the most extensive pen collections in the world. 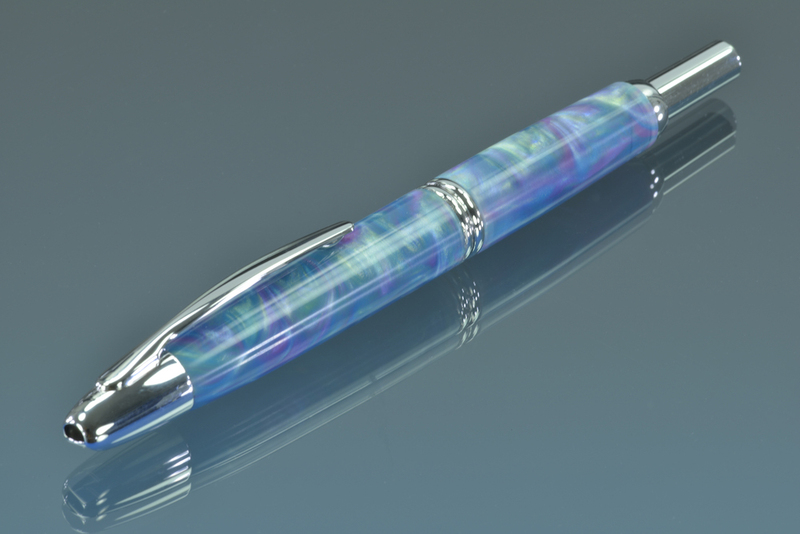 Intense passions have organically evolved into Richard’s artistic expression of creating his on line of pens and exquisite jewelry. Richard is also an accomplished photographer. As an artist myself, I am always eager to see what new inspiration is on the verge of becoming Richard’s latest creation. The repaired Duofold pen arrived yesterday with the extra refills. Thank you very much for doing a great job with the super speedy repair (same day as you received it) and polishing. It looks and functions like new again – my very first impulse when I removed it from the excellent protective packaging was to first use it again and then look at the overall appearance of the pen. I was not disappointed with either and quite frankly it was like being reunited with an old friend, as it has been in disrepair for several years until I stumbled upon your web link. Great Job!!! I am a very satisfied customer and feel free to use my feedback on your web site. Thanks Again. These are fantastic pens. They are handmade and the quality is superb – as good as you will find. They are made from custom colored plastic, and what colors they are. I have two, and I love them both! Richard has produced some of the most exciting new plastics I’ve seen, and incorporated them into a wonderful pen design in his Foresta Verde. Richard worked on the design carefully, taking the time to do it right, and it shows in an amazing pen. The design of the pen itself, from the shape to the novel clip, shows an understanding of how to make a pen that not only works, but feels good to work with. The pen has a heft and balance that’s perfect for my hand, which makes it a joy to write with. All that, and it looks good too. The Foresta Verde reflects Richard’s superb craftsmanship and passion for pen making. I’m looking forward to his next design in eager anticipation. I’ve had the privilege to watch Richard make his pens from start to finish. He is the only pen maker that I know of that actually makes his own plastics, Clips and nose cones. More time and passion are in Richard’s pens then any other I sell. Keep it up Richard! Now make me some pens to sell. Richard thanks for the fast response. Betsy is a pleasure to work with.